RIO DE JANEIRO, BRAZIL – The U.S. Secretary of Defense, Leon Panetta, has visited Brazil as part of a wider Latin American tour which also takes in Colombia and Chile. The visit, his first both to Brazil and Latin America in the role, was touted as an attempt to fight crime in Central America and to forge deeper military ties with the region, but Mr. Panetta has also pressed for the U.S. and Brazil to sign off on two stalled defense contracts. 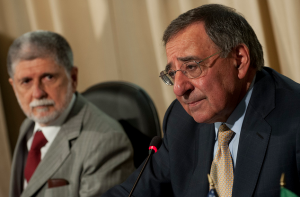 U.S. Secretary of Defense, Leon Panetta in meeting with Brazil’s Defense Minister Celso Amorim to forge deeper military ties and discuss defense contracts, photo by U.S. Navy Petty Officer 1st Class Chad J. McNeeley. He expressed his admiration for Brazil, describing it as “a very important force for stability in the region” and “an important partner.” The comments follow the signing by both U.S. and Brazilian president of the so-called joint Dialog on Defense Cooperation. “If the United States is interested in deepening relations with Brazil, it’s important not only in terms of trade, but also the ability to develop partnerships,” said Amorim. This week’s visit is the latest in a string of recent high-level diplomatic exchanges: President Rousseff visited the United States earlier this month, and the U.S. Secretary of State Hillary Clinton came to Brazil on an official trip last week. This time, the Pentagon’s “to do” list holds a remarkable number of topics: from cooperation on military and security issues, and Brazil’s increased presence on the world political and economic stage, to offers of U.S. its help for Brazil’s World Cup and Olympic preparations. “This is a way of making contact and dealing with the region at a time when there’s growing concern over the ability of many countries to handle the threat posed by transnational crime and, specifically, drug trafficking organizations,” Steve Johnson, a former Pentagon official specializing in Latin America, told broadcaster Voice of America. However, others believe it is likely that the two-day is a more low-key, scouting trip to get to know the key military players in South America. Peter Hakim, president emeritus of the Inter-American Dialogue in Washington D.C., says such a wide range of issues points to a trip with little focus to it, and has more to do with mutual lobbying for defense contracts. “The U.S. continues to hope and lobby for a Brazil decision to buy [US$5 billion worth of F/A-18] Boeing fighter jets – rather than Swedish or French models, and Brazil is still eager to sell the Embraer [Super Tucano military aircraft] to the U.S. for use in Afghanistan,” he told The Rio Times. The U.S. is bidding for a contract to sell Brazil Boeing's F/A-18 fighter jets in a deal totaling some US$5 billion, photo by U.S. Marine Corps. The United States had announced it was going ahead with the Embraer deal, totaling US$380 million, but this has since been put on ice following complaints by American rival Hawker. However, policy expert Peter Hakim says that, militarily, Latin America simply does not carry the importance to the U.S. that has been alluded to. Moreover, making a point of mentioning assistance over major sporting events – not something of great important to the U.S. Department of Defense – goes only to press this further. Despite warm words over cooperation in Haiti in the wake of the devastating earthquake in 2010, all the time Brazil pursues active relations with countries such as Iran (Brazil is a key negotiator over the Islamic nation’s nuclear program), a major rapprochement from the U.S. is unlikely. The United States has a real obsession with the Middle East and the Far East. I hope they stay there for long and do not come here because Wherever they go they bring problems with them. As an American, I wish just the opposite. I wish we would REMOVE ourselves from the Middle East altogether, let them handle it from here. We have done all that we can do and yes, caused some problems along the way. No one is perfect though. I think that a Brazil/U.S. partnership could be beautiful for both countries if gone about it the right way. I think we should start with removing Visa requirements for each and let the natural path to friendship and trade grow from there. Everything within the boundaries of what is best for each of course. I have nothing against american people as a whole. I think there are good and bad people anywhere in the world. But I am strongly against american policies for the rest of the world. Basically I believe americans interfere too much. And they have interfered a lot against Brazil´s interest. USA is against Mercosul and Unasul – international organizations that aim to strengthen commercial ties and defense of the South American countries. The U.S. government wants at all costs that we join and stay in the NAFTA and OAE, where they have almost total control. There is no balance in these policies. I understand your points of view Pedro. I will not agree nor defend any position as I would need to educate myself more on the particulars of these matters so I will remain neutral at the moment. But I will disagree with your second statement. Actually most Americans do not agree with the way the American government interferes in other countries’ affairs. I myself am one of them. If I could control this, I would but I cannot. And as well both know, electing officials who promise to do something but then don’t is rampant in the political system. I do not agree with America trying to bully other countries into their way of doing things. Anyone can make suggestions and given their points, pros and cons, etc but in the end, everyone should do what is best and works for them. Most Americans feel this same way. We just want to work on our OWN problems here, we have many, and stop interfering in everyone else’s policies. That is truly what most Americans believe and want. 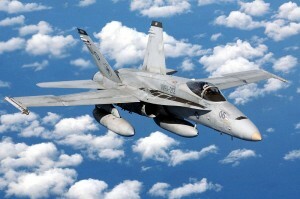 Brazil does not need the F-18. It is difficult to imagine its use. For sure it will not be used to patrol the jungle boarders of Brazil. Still air defense is air defense, so what is the creditable alternative? All the candidates are air defense aircraft against WHO? WHAT Type of threat. We just need to reset some F-5 and some french Mirages that are falling apart. We just need a small air force. For over 30 years we did not do not spend a penny in new fighter aircraft. However the USA want to sell us the f-18 super hornet and the whole package of services (spare parts and maintenance) that accompany the package. They also know that after the initial purchase of 36 fighters other acquisitions will be made. According backstage talks Brazilian government’s intention is to acquire 100 to 120 fighters over the next 10 or 15 years. Did you know that the entire budget is spent by the Brazilian military Farcas American military in just eleven days? *Did you know that all the Brazilian military budget (1 year) is spent by the U.S. military in just 11 days? Do you have any idea why they spend so much of the taxpayers money with the military? Brazil wants to have a bigger say on the world stage, more in line with its economic impact on the world’s economy. And in doing so, they will also aquirer more responsibility to the world community.The days of small military budgets are over, not only does Brazil have a bigger role to play, but they also are a bigger target. Regional friends and enemies will no longer maintain Brazil’s primary focus. The real threat will come from over the horizon, and they best be prepared. Now Brazil will have to extend their reach militarily, initially as a deterrent force, but eventually as an additonal persuasive tool for emplimentation of foreign policy.Have no doubt about it, Brazil is on the map in a big way, and some of those eyeing it are licking their chops.